The ultimate office desk accessory, this branded CalendarPod Midi Dart is a great choice for your next promotional giveaway. This item includes an A7 pad of sticky notes and five index tabs with 25 sheets in each, which are perfect for bookmarking documents. 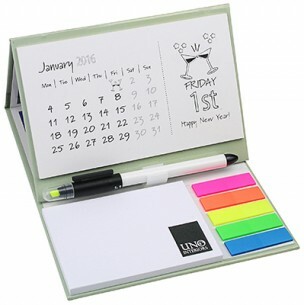 It also comes with a pen and 12 calendar sheets with a month to view, making it a fantastic item for office workers. We will print your decoration on this item via litho or digital print.